Sunfish, or bream are colorful panfish found in most American ponds, lakes and clear bodies of water. They vary in size from just a few inches to perhaps 1 pound. Most members of the sunfish family have very small mouths although they do have full sets of sharp teeth. Most of the smaller mouthed sunfish such as bluegill and pumpkinseed specialize in eating insects, tiny fish, crustaceans and other small prey. A few members of the sunfish family have larger mouths and specialize in eating larger prey such as minnows, frogs, crayfish and other animals. Depending on the environments where sunfish live, their diets may vary seasonally or remain somewhat static. Like most fish, sunfish slow down considerably during cold temperatures. Although sunfish may not feed regularly in winter, they do eat when food is available. As the days grow longer and temperatures rise in Spring, sunfish feed heavily. By May, most populations of bluegill have begun spawning. Males feed less as they are busy defending their nests and protecting young after they hatch. Once spawning is finished, sunfish return to a pattern of heavy feeding. Although they may become less active during the heat of the day, summer sunfish usually feed heavily in the early morning and again late in the day. In most environments, insect larvae, worms and other small invertebrates make up a large portion of sunfish diets. Many of these food sources are related to seasonal or weather-related events. For example Spring rains or snow melts may wash food into waterways, providing periods of plentiful food sources. Similar events happen in Summer, when thunderstorms flush insects from trees and other vegetation. 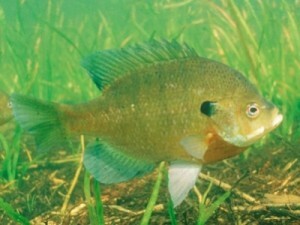 In tidal swamps, similar feedings occur when abnormal tides cause food to be swept into sunfish habitats. In lakes and farm ponds, minnows, forage fish and young of other species are important food sources for sunfish. In some cases this becomes a race for survival as competing species feed on each others young. For sunfish that live along the edges of small farm ponds, creeks or other waterways that border grassy areas, grasshoppers and crickets are an important summer food source. These insects jump to evade predators, often landing in the water. In areas where this occurs, sunfish, bass and other fish quickly adapt, attacking any insect that lands on the surface. In many areas, crayfish are an important component of sunfish diets. Although many crayfish are too large for sunfish to prey on, their young are easy targets. In addition to taking young fish, sunfish sometimes encounter crayfish that are in the molting stage. During this brief period, crayfish are vulnerable and are readily eaten by sunfish. In tidal swamps and creeks, grass shrimp are abundant. These small, transparent shrimp are the perfect size for sunfish. Tidal water sunfish often make grass shrimp a main food source.